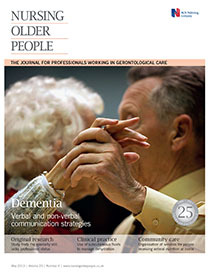 Aim To investigate the attitudes of healthcare professionals towards working with older people, including their perception of how other professionals perceived their work in gerontology. Method Data were collected using a 20-item Multifactorial Attitudes Questionnaire (MAQ) in the West of Scotland with a five-point Likert scale for responses ranging from strongly agree to strongly disagree. Questionnaires were distributed to hospitals and community settings by post and by hand in 1999 and 2009, and also by email in 2009. Results In total, 376 healthcare staff working in primary and secondary services not exclusive to older people completed the MAQ in 1999, and 546 staff responded in 2009. The results showed that, although the respondents in 1999 and 2009 were enthusiastic and positive in their approach towards caring for older people, their work carried little professional kudos. Working conditions and the working environment were regarded as detrimental to recruitment of staff in gerontology, and respondents did not think that other health professionals valued their gerontological expertise. Conclusion The use of the MAQ in 1999 and 2009 enabled a comparative analysis of two studies completed a decade apart. Comparison of the MAQ results from 1999 and 2009 show that attitudes towards the care of older people as a recognised specialism have remained largely unchanged, despite a decade of major policy changes to include gerontology in pre- and post-registration nurse training. This finding does not bode well for attracting nurses into a career in gerontology. As a consequence, with increasing numbers of older people living in Scotland, and worldwide, the care and wellbeing of this group may be compromised at a time when it is most needed. The lead author (AK) has used the MAQ for an international study with colleagues from Germany, Sweden, Japan, Slovenia and the US, the results of which will be available shortly.